Have you heard of John Philip Colletta? If not, then you’re about to! I believe I first heard Colletta speak at the NGS Family History Conference in 2014 in Richmond, VA. Excellent speaker, very engaging, just an overall good storyteller and you come away having learned something. How excited was I, then, to receive an email today about this?? I am very grateful to the Allen County Public Library and Allen County Genealogical Society of Indiana, Inc. (ACGSI), for hosting Mr. Colletta for an all-day learning experience! Not to mention, this is a very affordable one-day seminar, ranging from $10 as a member of ACGSI for the morning session to $45 as an ACGSI member for morning and afternoon sessions plus the evening banquet. This is one not to miss! Make plans to get to Fort Wayne, Indiana, in June! It’s nice to have basically an electronic journal of what I’ve done or attempted to do for the last year. There were a couple slow months, I know. I’ll take this time to list my achievements and goals for the next year. 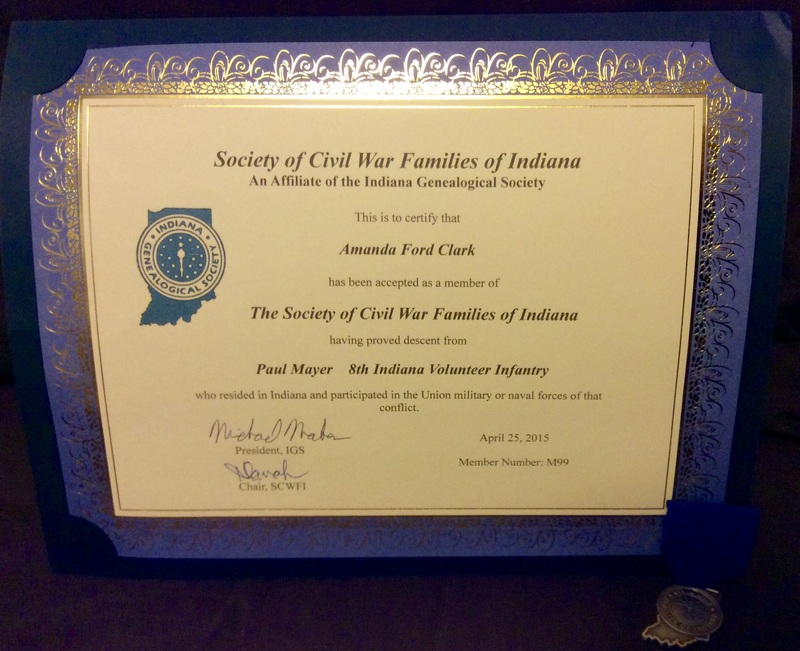 Approved for Society of Civil War Families of Indiana (SCWFI) (Civil War ancestor: Paul Mayer). Approved for NSDAR (Patriot: Thomas Pearson). Began researching for a portion of my BCG portfolio. Start a local genealogy society (officially by 1 Jan 2016). Volunteer more hours at local historical society. Swearing-in ceremony for Sarah Winston Henry Chapter of INDAR (Sept 2015). Create the yearbook for Sarah Winston Henry Chapter of INDAR (Sept 2015). Attend regional INDAR meeting (Aug 2015). Add two more of my ancestors to SCWFI (John Ford and Lyman S. Ford). Begin working on NSDAR supplemental for William Ballard (born 1715). Finish studies through NGS (got this in under the wire! Signed up for the NGS Guide to Documentation and Source Citation!). Attend OGS Conference (Apr 2016). Attend IGS Conference (Apr 2016). Attend Midwestern Roots 2016 (July 2016). Attend FGS Conference (Aug/Sept 2016). Attend APG’s PMC (Sept 2016). Put together another family reunion (Oct 2016). Apply for First Families of Ohio (James A. Fowler and his wife Elizabeth Devore). 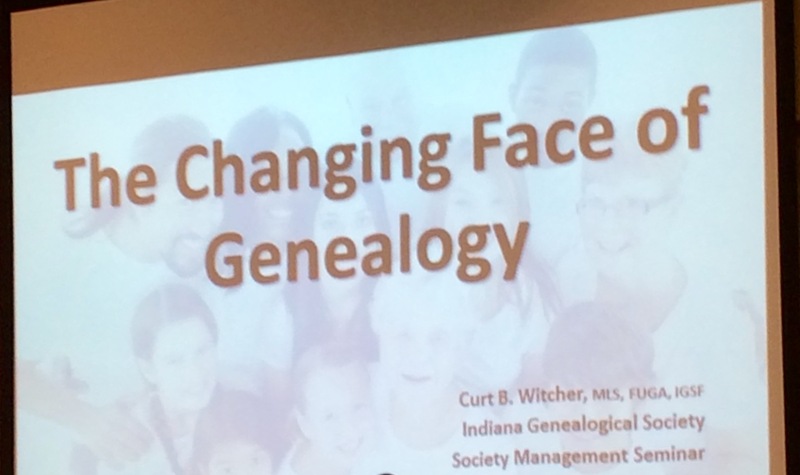 The IGS Annual Conference was hosted by the Wabash Valley Genealogy Society and held at University Hall on the Indiana State University Campus in Terre Haute, Indiana, on 25 April 2015, featuring Judy Russell, JD, CG, CGL, for four lectures. Four other lectures were offered, two about Terre Haute/Vigo County and two about DNA. I decided to sit in on the Terre Haute/Vigo County sessions and then the final two Judy Russell speeches. Mr. Mike McCormick spoke first about the history of the settlement of Terre Haute. His speech was very informative and enlightening as to the history of the town. I was particularly interested in early business, i.e. breweries, and the Wabash-Erie Canal. Mr. McCormick is the county genealogist for Vigo County for IGS, and most of his speech was from memory! Next up was a session about the website Wabash Valley Visions and Voices (WV3), which is a digital memory project. Donna Adams and Vikki Sordean are members of two of the charter partners, and they spoke about getting this project off the ground. The project includes partners, different regional repositories, who agree to share their digital collection online in this consortium form. There are thousands of pictures, documents, and oral histories included on the site, searchable by subject, county, name. Much work goes on behind the scenes, including scanning fragile items, labeling them and tagging them to be found online. What a wonderful effort. I applaud them for their hard work and diligence. 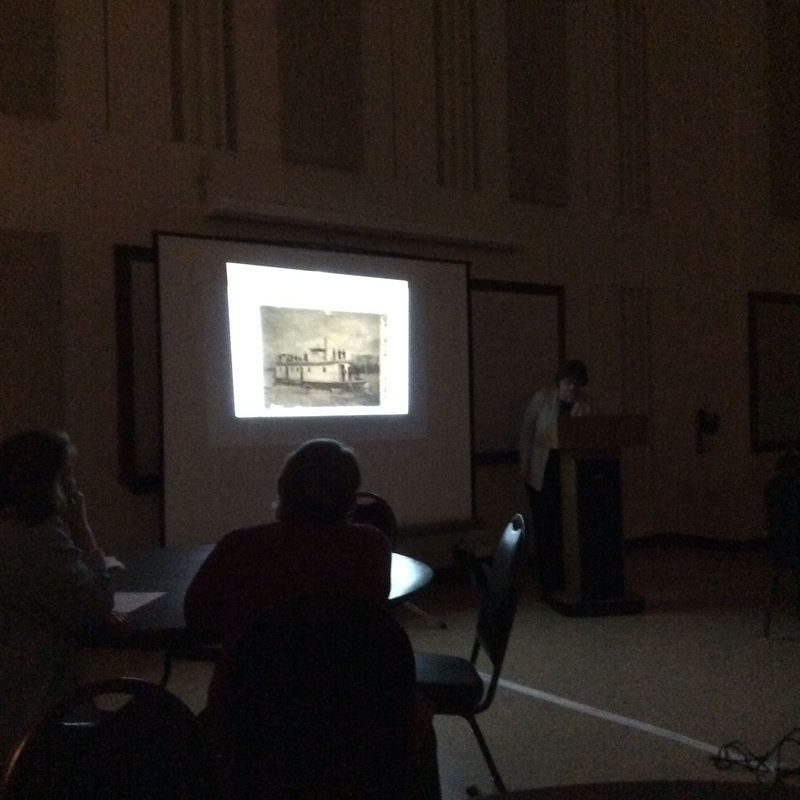 Donna Adams showing a steamboat picture (the Diana, a Wabash River steamboat) from WV3. The annual meeting of IGS was held after lunch with general updates and an award ceremony. It was nice to hear firsthand what the Society is doing, where it is headed, and learning of achievements from all around the state. 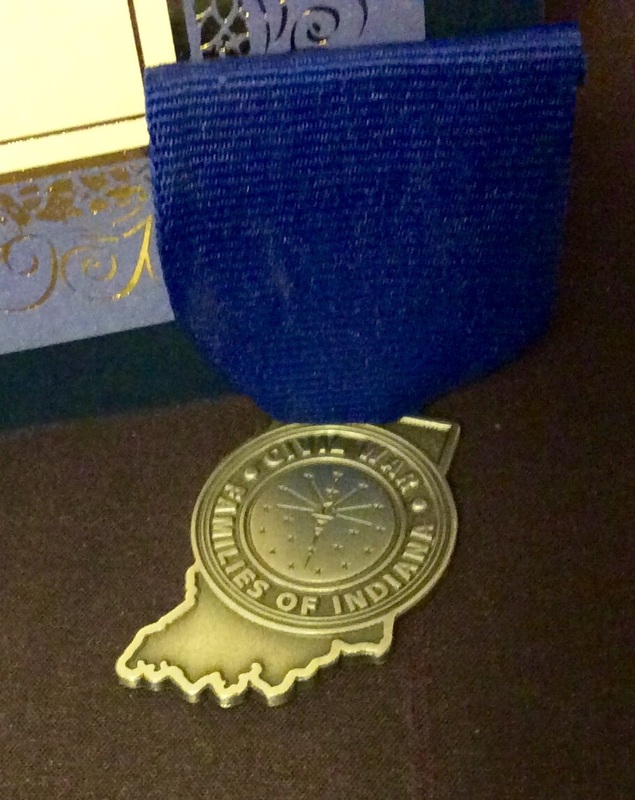 I was part of the 2014 inductions into the Society of Civil War Families of Indiana, having my ancestor Paul Mayer proven. I hope to have my father and son Civil War ancestors added to the list next year. The certificate is beautiful in person. The final two sessions I attended were both presented by Judy Russell…you can’t go wrong listening to her speak! 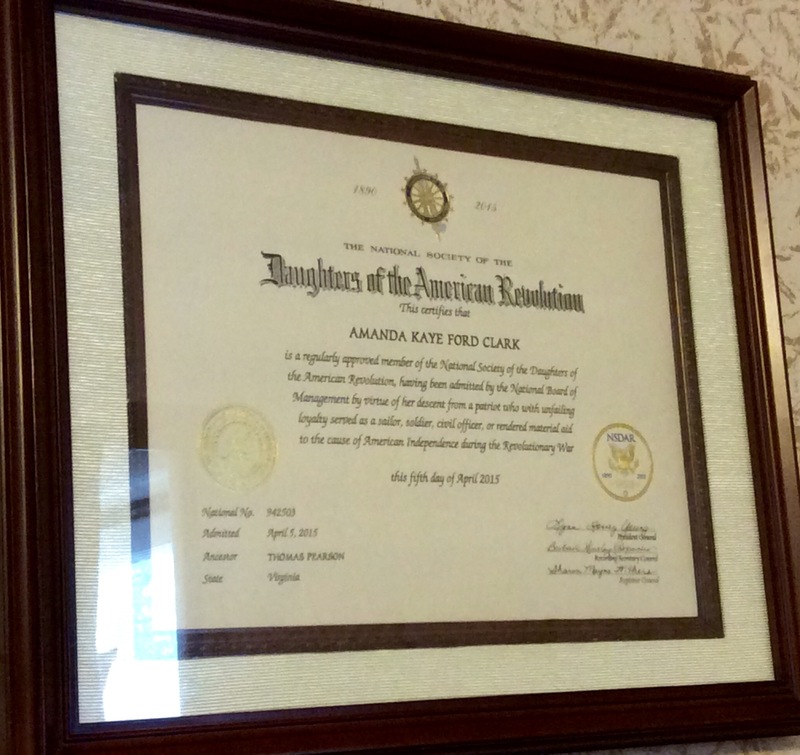 Her speech, titled “Staying Out of Trouble: The Rights and Responsibilities of Today’s Genealogists,” I have actually heard before; it never hurts to hear this one again though! Many things to consider when looking for records and when using records (I’m looking at you copyright!). 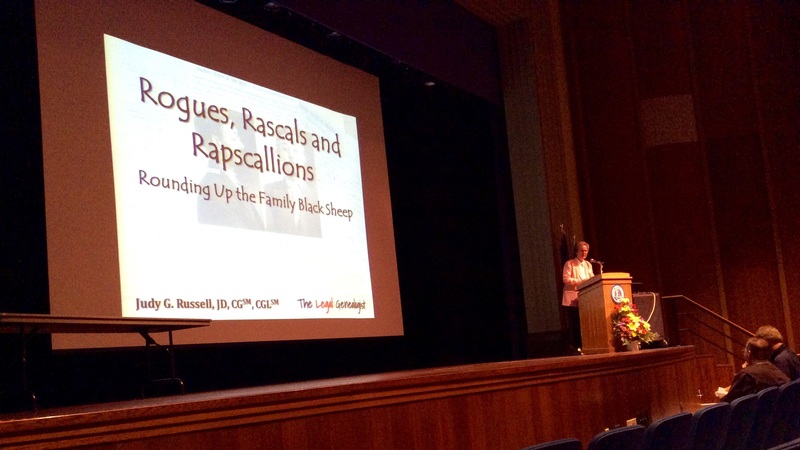 The final lecture was about the black sheep in the family, “Rogues, Rascals, and Rapscallions: The Family Black Sheep.” I hadn’t really given it much thought, other than, say, criminals being black sheep, but Ms. Russell outlined three groups of black sheep characters: Law Breakers, Philanderers, and Deadbeats. The black sheep of the family usually provide colorful records of the past, and, while those related to the black sheep at the time have to live through their blunders, the descendants of said black sheep can revel in the record-finding! All in all, I had a great couple days in Terre Haute, lots to learn and meeting new people. I am very much looking forward to the Annual Conference to be held 15-16 April 2016 in Fort Wayne, Indiana! I think this slide sums it up very well, the current barometer of genealogy. Change is a constant in our lives, especially in our genealogical lives. I began researching in 2001, a little while after Google had been on the scene. That opened up an entire new world for me, seeing pieces of history at my fingertips. Then, of course, I wanted to see these things in person and I haven’t looked back (figuratively, literally I look back into the past a lot!). Just the changes in the past 14 years are astounding, e.g. OCR, digitalization, DNA! Change fuels this passion, I believe. Sometimes, though, it’s not easy to embrace change…it can be difficult moving out of our comfort zones, learning new genealogy software, navigating new websites, wrapping your head around DNA. I’m a fairly shy person, more of a follower than a leader. I’m trying to break out of that shell and meet people at these get-togethers to forge some acquaintanceships. I’m considering having a get-together locally to see if anyone else in my community is interested in starting a genealogy society or just learning more. Me, a leader? Yikes! With regard to genealogical societies, one pressing issue is social media, spreading the news. Mr. Curt B. Witcher hit the proverbial nail on the head when he said that people expect a response within an hour when they tweet or post on Faceback, no later than 24 hours. People are now accustomed to almost instant feedback, instant information. Also, people want something of value for free. Maybe a searchable database on the society’s website…maybe just that the society has a website posting information, welcoming and encouraging attendance at meetings and volunteering. Something else I learned at this seminar, well, among a number of things, is what happens when a new society is born. A LOT happens is what happens! I thank the Wabash Valley Genealogy Society officers for opening my eyes to what is involved, how much hard work it entails and how much knowledge and fun is achievable. The WVGS is a lovely group who hosted this year’s IGS Conference, and every person from their group that I had contact with exuded friendliness and seemed genuinely happy to be there and hosting their guests. All in all, it was a great day…definitely worth attending! Ron Darrah, Corresponding Secretary for IGS, expounding on the benefits of your society’s newsletter/journal. 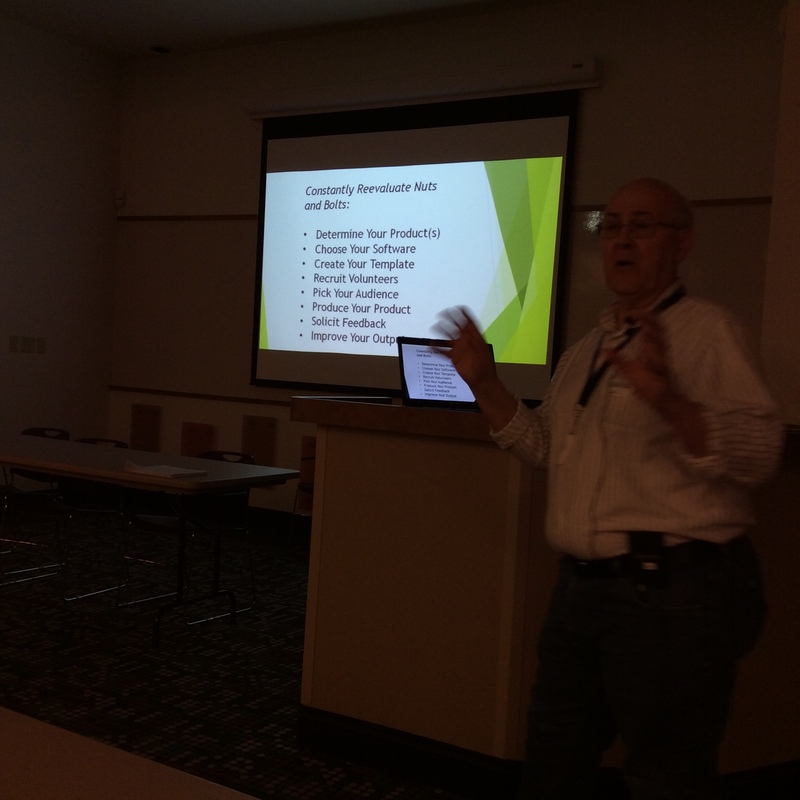 Check out his blog for upcoming genealogical events and issues! 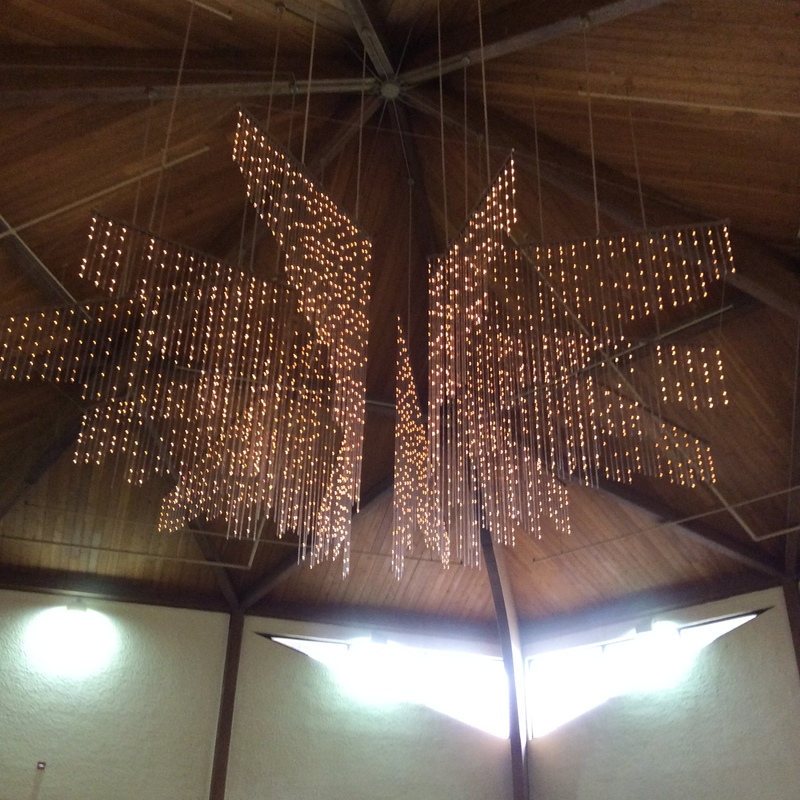 Fabulous chandelier in the library. I’d like this in my house. Maybe they’ll let me live there? Sullivan County, Indiana, courthouse, taken from the library. Received this on 20 Apr 2015. Beyond thrilled. Have spent much time on the 21st looking through the national website, haven’t even touched the state website yet! For me, this is such a huge honor. My patriot is Thomas Pearson. 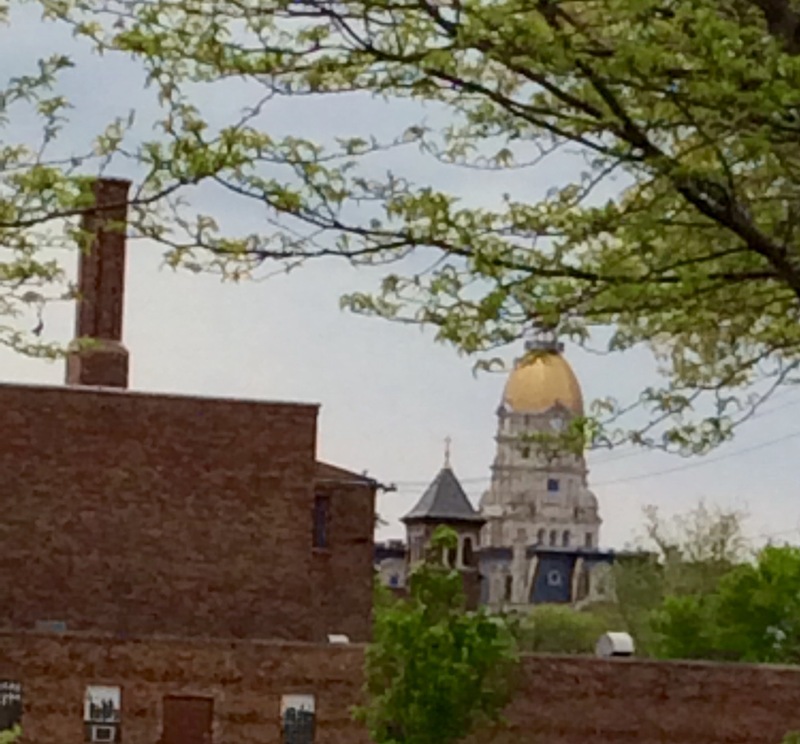 Tomorrow, I leave for more genealogy fun in Terre Haute, Indiana, in anticipation of the Indiana Genealogical Society Annual Conference on 25 Apr 2015. First, though, research in Sullivan County, Indiana, and then the Society Management Seminar on the 24th. Soon, I’ll take a breather and catch up here…lots of stuff to share!